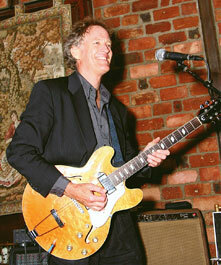 Jim Turner, guitarist extraordinaire, harmonica virtuoso and band leader, is a fun guy. He played the wedding of VOX creative director Ryan Salinetti, and stayed until 3 a.m. — the wedding had ended a little after 11 p.m. Some of the wedding guests even got on stage and jammed with the band a few times. For that event, Turner assembled a large band (dubbed The Jim Turner Experience by the attendees) and played jazzier fare than the barefoot in the sand sing-alongs he is known for. In addition to giving guitar and harmonica lessons locally, Turner plays an eclectic mix of covers and originals at various spots around the East End. And you might just run into him at a beach party or wedding.